Where this differs from the main site is that this one is basically set up for 2 pests; Wasps and Glis Glis. The homepage links to both but once in the individual sections everything is geared towards that Pest. For instance – When you are in the Glis Glis Control South Bucks section the main links leaving that page are to the areas where Pest Control Bucks provide Glis Glis control services. 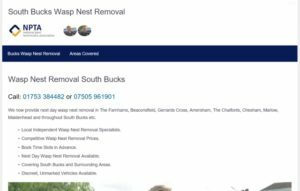 Likewise – When in the Wasp Nest Removal South Bucks section the main links leaving that page are to the areas where Pest Control Bucks provide Wasp Nest Removal services. Try it out yourself – Visit the South Bucks Pest Control Services and follow the links to the 2 main pests sections.